In the late fall of 1095, Pope Urban II gave a speech in Clermont, France, and set all of Europe into motion. As many as a hundred and fifty thousand people eventually responded to the call, leaving everything they knew behind to undertake what appeared to be a fool's mission: marching several thousand miles into enemy territory to reconquer Jerusalem for Christendom. Against all odds they succeeded, creating a Christian outpost in the heart of the Islamic world that lasted for the better part of two centuries. 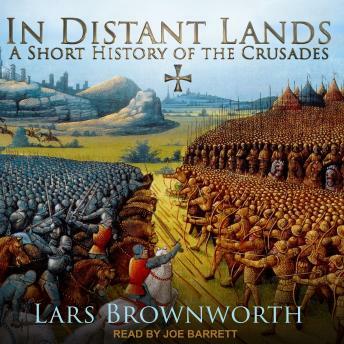 Perhaps no other period in history is as misunderstood as the Crusades, and in this fast-paced account Lars Brownworth presents the entire story, from the first clash of Christendom and Islam in the dusty sands of Yarmouk, to the fall of the last crusader state. Along the way he introduces the listener to an exotic world peopled by mighty emperors, doomed Templars, grasping generals, and ambitious peasants. Some of the most famous names of the Middle Ages-Richard the Lionheart, Saladin, Eleanor of Aquitaine, and the legendary Prester John-illuminate this era of splendor, adventure, and faith.